Every camp has different ways of making their staff feel appreciated and of celebrating success. One of my favourite ways to do this is by giving Warm Fuzzies. Warm Fuzzies are encouraging little notes that you give each other as a pick me up or to say ‘job well done’. 1. Write each staff person’s name on an envelope with the open end facing up. It can be any size envelope just as long as it has an open top. I like: To use a manila envelope, make sure both ends are closed, then cut it down the middle – voila two warm fuzzie envelopes for the price of one! 2. 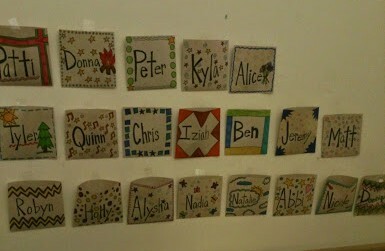 Either decorate the envelopes for the staff as a ‘gift’ or have them decorate it themselves to personalize it. 3. Teach your staff about warm fuzzies and the purpose of them. Some camps read “Have You Filled A Bucket Today” by Carol Mccloud to help staff understand the purpose of warm fuzzies, it’s not something I’ve done, but we’ve talked about it. I like: The idea of reading “Have You Filled A Bucket Today”! Always be positive in your notes, either mention a specific moment “thanks for helping me clean up after tuck, we make a great team!” or general “I’m so glad I got to work with you this summer, you’re so fun to be around” but avoid giving backhanded compliments “no matter what anyone else says, I think you’re a great counsellor”… aww.. thanks, you think I’m a great… wait… what?! other people are saying I’m not a great counsellor? The last type of note has the opposite effect of a warm fuzzie, they make people doubt themselves and leave them with an icky feeling. We’ll call them mean nasties. Let’s avoid mean nasties. I like: Keeping the ground rules positive, notice I didn’t start any of them with “No”. But that’s an old counselling trick, so you already knew that. 5. Be a role model. Write as many notes as you can. Full disclosure, I’m terrible at this, I love the idea of giving warm fuzzies but I’ve struggled to find time in the past, so this year I didn’t try to give EVERYbody one EVERY time. I gave them out when I felt like someone needed a pick me up, or when someone did something truly outstanding. I also kept a little tally of how many I had given to whom to try to keep it pretty even and that helped. Every so often I’d write one to everyone at once, it would take a while but it was worth it. I like: Using specific paper to write notes, not just a page ripped out of a notebook or a post-it. More on that below. 1. I learned that it’s easier to write warm fuzzies when I have the paper/pens/markers/stickers ready to go. So I put together a pencil-case of fancy note writing stuff that I could whip out when I had a few extra minutes. It made a big difference, plus I really like stationary and office/ A & C supplies, so it made it more fun to write them. I don’t use the Hot Mess Citation seen in the picture for warm fuzzies, but I throw them in the pencil-case because I do hand them out sometimes as a joke (to staff who would find them funny, and sometimes I give them to myself too…). I use pretty stationary, little cards, and sometimes camp themed postcards. 2. There’s some debate about whether the notes should be left in the envelopes or not, I don’t really have a preference. I typically leave mine in though. 3. 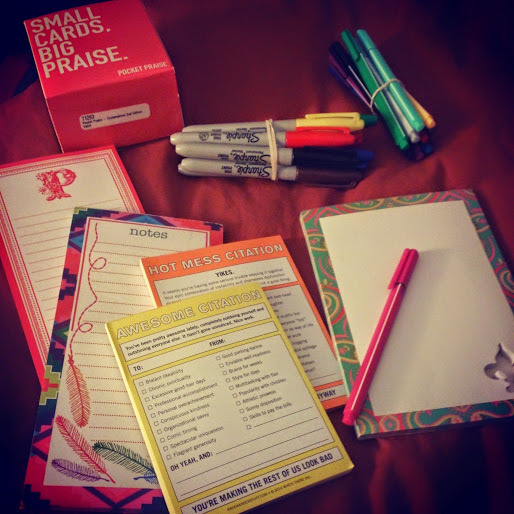 You can put other things in besides notes, one year I gave out bookmarks with inspirational quotes on the front and a little note not the back – be creative, have fun! 4. Work with your leadership team to ensure that everyone is getting warm fuzzies throughout the summer, one easy way to do it is to have them divide the staff up and make sure that they write a note to a specific group of people at least once or twice during the summer. So that’s it. Your quick guide to giving warm fuzzies at camp, I highly recommend implementing it. It’s such a nice feeling to get a little note from a colleague who noticed something good you’ve done. It really does brighten up your day. And on the tough days, it’s sometimes nice to read some old ones and give yourself a pick me up. Do you do warm fuzzies at your camp? Do you think they’re a useful way to support your staff? Tell me about it in the comment section below. Don’t forget to find me on Facebook, Instagram, Twitter, Pinterest and Google + for more camp nerdieness! All you have to do is follow using the buttons below.